Gumer Isayev, Middle East expert and faculty professor at St. Petersburg State University, talks to Gazeta.ru about causes behind the conflict in Libya, Jamahiriya, the Green Book, and Russia’s stand in regard to the Libyan conflict. Q: Being an expert on the Middle East, how do you assess the recent events in Libya? What’s actually happening there, is it a “clash of civilizations”, a “crusade’, an attempt to protect democracy in Libya, or an attempt to overthrow Gaddafi’s regime orchestrated by some countries, or perhaps a war for Libya’s natural resources, or still something else? Obviously, the “uprising” in Libya was inspired by popular unrest in the neighboring Arab countries. But unlike the peaceful protests in Tunisia and Egypt, Libya’s uprising was armed, and quite possibly relied on some external support. The revolution bug appears to have bitten a large number of Arab countries, but in Libya it seems to have developed into an acute condition. There are witnesses who confirm that the uprising was pre-planned, that groups of youths attacked police and local authorities’ buildings in different towns at the same time. But the crucial role was played by the fact that Gaddafi secured the support of a large share of the population, especially in the country’s capital and in the West. There were no massive protests in Tripoli, and the rebellious East has demonstrated the breakaway ambitions of Cyrenaica that Libyan Jamahiriya had already dealt with before (although the number of rebels there did not exceed a few thousand). Gaddafi wisely waited out the critical phase and went on to some successful attempts to re-unite the country but faced serious counteraction from the West. 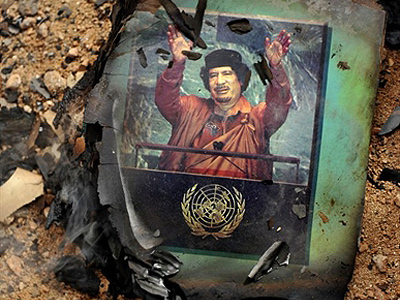 The attempt to overthrow Gaddafi by “global effort” has been quite cynical. Libya’s business partners, including Italy, France and other European countries, which until recently were signing multi million dollar contracts with Gaddafi now all of a sudden claimed his regime to be illegitimate and openly took the rebels’ side. It’s no secret that Gaddafi has ceased to be a thorn the West’s side over the last decade as he gave up a number of notorious projects related to development of weapons of mass destruction, let the U.S. oil companies in on the Libyan market, paid compensation for the Lockerbie bombing, and started liberalizing the domestic economy. Nevertheless, the colonel didn’t entirely “mend his ways”: the Americans got hold only of a small share of Libya’s oil reserves; the Lockerbie bombing, though paid for, was never admitted guilt for, and the project to privatize the state oil production company also fell through. 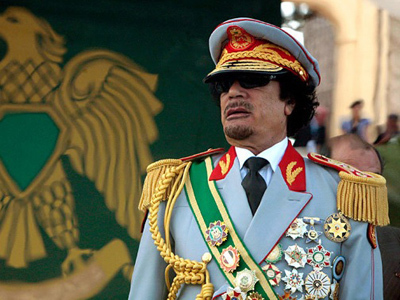 Gaddafi was actively promoting the idea of African unity and a single currency pegged to gold, and he heavily criticized the West’s policies in Asia and Africa. Removal of sanctions in 2003 stimulated economic growth and turned Libya in a rapidly developing economy capable of making Gaddafi’s dream come true i.e. turning Libya into the leading power of the region. Therefore it is not about Gaddafi’s Western partners suddenly becoming appalled at his being cruel to the rebels. Western powers simply took advantage of the situation, i.e. a temporary weakness of the Libyan leader, to back up the uprising. An unstable situation in Libya is in the European and U.S. hawks’ opinion better than a strong and ambitious Gaddafi. That is why the desperate West started to stir up the almost gone fire of the civil war. And whereas for the United States, this war would be across the ocean, Europe might harvest some big problems ensuing from it in the very near future. And this tells us that in fact European leaders followed their U.S. counterparts. Q: How do you explain the fact it wasn’t the U.S. but France who was the first to bomb Libya? Is it simply part of the West’s overall campaign against Gaddafi’s regime, or maybe France has its own interests and accounts to square? A: The United States is already running two wars, in Afghanistan and Iraq. 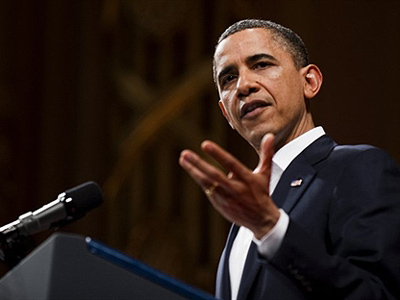 The incumbent president, Barack Obama, came to power surfing a wave of anti-war sentiment in American society. He positioned himself as a man to dramatically change U.S. foreign policy and withdraw the troops from Iraq. He was awarded the Nobel Prize in anticipation of his achievements. Therefore Obama hardly stands a chance of convincing the voters that the United States must get involved in yet another war. According to recent polls, the majority of Americans do not support the idea of the U.S. intervening with Libya’s affairs in any way. Voters won’t forgive their president any more losses. It was no coincidence that as soon as a report of an F-15 fighter aircraft being shot down was released, Robert Gates hurried to make a statement that the active phase of the operation is nearing its end. The U.S. fear getting involved in a war for the same reason Germany had to give up aggression. They fear the public reaction. But that seems to be of no concern to Sarkozy who was never hiding the special nature of his relations with the United States. 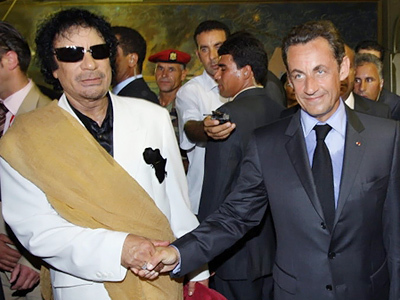 While the U.S. is biding in the shade, Sarkozy is willing to do the dirty work and take the risks as he has nothing to lose. The French president’s ratings are quite low, and he badly needs a “little glorious victory.” Neither is Sarkozy concerned with the fact that destabilizing Libya will send off new waves of illegal immigrants straight to France. “After us, the deluge” – this famous French by-word aptly characterizes the president’s demeanor. Under current circumstances, it would be appropriate to recall the events of 1956 when the U.K., France, and Israel attacked Egypt attempting to win back the Suez Canal nationalized by Gamal Abdel Nasser Hussein. 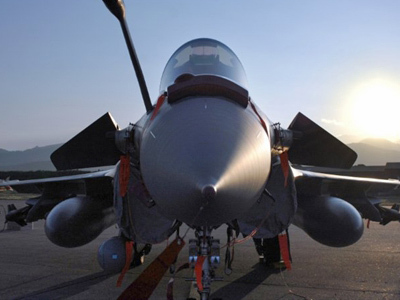 The initiative belonged to Israel while France and the U.K played peace-makers while breaking into Egypt’s territory. The United States stayed out of this, not wishing to mar their reputation with the Arab world. Q: The fact that the Libyan conflict has been broken into by the Western powers means that it’s altogether a different story than that in Tunisia or Egypt. Can we say that Libya is going through what Afghanistan and Iraq did? 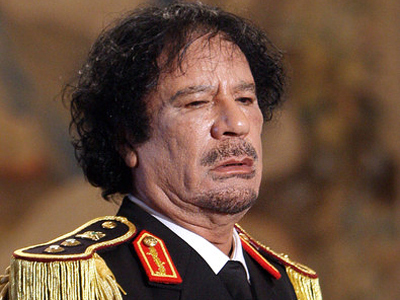 Can we draw parallels between Muammar Gaddafi and, for instance, Saddam Hussein? A: The recipe for intervening with internal affairs of countries in disfavor is basically the same. The parallels with Iraq are obvious. Aggression was preceded by a media attack whose goal was to justify the necessity to overthrow the ruling regime. In case of Iraq, Hussein’s regime was accused of secretly developing weapons of mass destruction, and the media unrolled a massive misinformation campaign. It only takes to recall Colin Powell flashing photographs of Iraq’s alleged secret WMD facilities and mobile laboratories to media cameras. In case of Libya, the focus was made on “bloodthirstiness” of the regime, and the story of dealing cruelly with peaceful protesters circled the world. The global community was thus prepared for the news of air strikes and bombings. Q: In 1977 Libya was announced to be a Jamahiriya, the latter being a term for a social order other than a monarchy or a republic, and in school geography lessons teachers often speak of the Novgorod assembly (‘veche’) and Jamahiriya as the ultimate forms of democracy which implement direct popular rule. Was Libyan Jamahiriya truly a unique regime, or the 2011 Libyan uprising only proves that in fact there was no democracy in the country? A: The ideas of the Third International Theory which resulted in the formation of the “state of the masses,” or Jamahiriya, may seem to be yet another social utopia passionately promoted into life by Colonel Gaddafi. In his Green Book which outlines key provisions of the Third International Theory, Gaddafi brought together in a paradoxical and unpredictable manner Islam, Pan-Arabism, and some Anarchism concepts, such as by Bakunin and Kropotkin. I personally think that Gaddafi tried to use direct public rule to overcome tribalism which was very strong in Libyan society and stood in the way of its modernization. 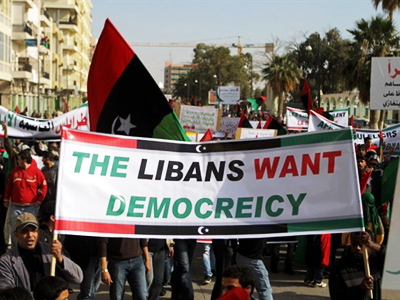 An attempt to create a “state of the masses” was in fact an attempt to reform the Libyan society divided by tribal conflicts and steer it to a new level of development. If we want to talk about democracy, it would be appropriate to compare Gaddafi’s regime to African and Asian regimes rather than to Western democracies, as the former quite often combine some attributes of a democratic society with quite authoritarian leaders in power. If we, however, talk about Libya’s social and economic system which prescribes just distribution of proceeds from oil sales among all citizens, it doesn’t look bad at all next to many of Libya’s “democratic” neighbours. No matter what we say about democracy’s universal values, imposing them by force is unacceptable, in particular when it goes hand in hand with abusing the existing political traditions which are centuries old. Q: What is your forecast for the situation in Libya? A: Leaders of the anti-Libyan coalition have gone too far to back down. On the other hand, it’s unlikely that Gaddafi’s regime can be overthrown by air strikes alone. 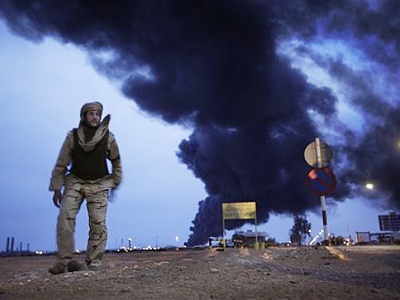 The hopes that insurgents would do the dirty job are failing despite active external support, bombings, and NATO troops already on Libya’s territory. Libya’s East is now attempting to set up some governing bodies with the help from the West, but it hasn’t gone far beyond some loud statements which is only indicative of poor organization of the insurgents, poor leadership, and absence of political goals except just one – to overthrow Gaddafi. At best, the insurgents might be able to win back a few towns in the East and set up an insurgency state there with the support from the West. Things in the way of a military land campaign are disagreements among anti-Libyan powers, fear of assured casualties, and public opinion in Europe and the United States. Besides, aggression from outside has inspired increased support of Libyans for their leader. It is true that the most adamant opponents of the regime continue to fight, but those who used to waver, and even those who once supported the uprising, realize now that the changes they hoped for might turn into a bloody anarchy and a replay of Iraq’s scenario. Q: This year has been marked by public turmoil in many Arab countries. 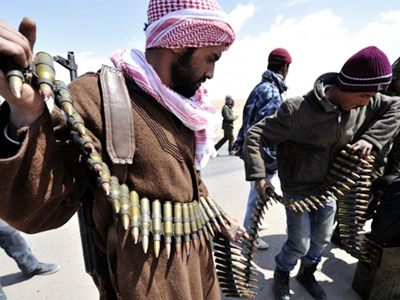 First, Tunisia, then Egypt, now Libya, and the Libyan conflict is drawing in more states. Your colleague Igor Alekseev in his interview to Gazeta.ru made a suggestion that the events in Egypt signified the end of the “concept of the third world.” Would you agree with this opinion? A: Indeed, considering the large scale of the turmoil in the Arab world, we may say that these processes bear signs of a new paradigm evolving in global politics. Obviously, Western powers wish to keep their position in the changing world. The United States is trying to curb the social protest by feeding the Arab world with a new “democratization” concept which, as it turns out, requires overthrowing “dictatorships.” The Arab world had a similar experience after World War II when the system of colonies built up by Britain and France collapsed. Yet, with the help of the U.S. policymakers, Middle East had been fully managed by the end of 20th century. Only a handful of states remained there which didn’t fit the prescribed patterns and tried to maintain an active political stand – Iraq, Iran, and Libya. Iraq has been done away with, Libya is being done away with right now as we are watching, and Iran has long since been waiting for its turn. Iran and Libya are a particular threat since they have been promoting a different way of development and tried to pursue alternative projects. The West would celebrate a glorious victory, should it succeed in deflecting the powerful impetus generated by today’s turmoil in the Middle East from solving the problems in this region and instead make use of it to overthrow the ruling regimes of Libya and Iran. Disrupting the situation in the Middle East may once again weaken this region and impede its further development. Q: What could you say about the situation in other Arab states hit by turmoil and violence this year, I mean Yemen and Bahrain? Where else might similar events yet take place? Would this chain of uprisings be contained within the boundaries of the Arab Third World countries or could it spread beyond? Do you think it true that the modern world experiences a deep conflict between Western and Islamic civilizations? A: Despite many differences, Arab countries have common history, religion, language. Events in Tunisia are expressed in protests in all the Middle East. But it’s hard to forecast, because in every region there are their hidden problems and conflicts, which in certain conditions may provoke political tempests. Outbursts of people’s anger have recently taken place in Syria, which in my opinion is among the candidates to the ‘black list’. As for the conflict of civilizations, I dislike such theories. Civilizations should be primarily viewed as cultural-historic communities, as it was designed by the classics of the civilization theories. The Muslim world is divided at the moment and does not have clear guides – it’s not a civilization in the full political meaning of the world, and economically it’s included into the Western system. Support of certain Arab states for the aggression against Libya says that the lines of rent are not between the civilizations. Q: What should be Russia’s position in the Libyan conflict? From the historic viewpoint? From the political viewpoint? From the economic viewpoint? A: Russia’s position on Libya is very important, as a landmark, as a litmus test. If it’s a pro-Western vector of development of the situation and rejection of the ambitions of the great power, then Russia’s timid policy in Libya is clear. By being timid I mean Russia’s abstention in the UN Security Council when voting for Resolution 1973. Instead of timid you can say indifferent or impassible – the idea will not change. If we speak about more serious ambitions than participating in Eurovision, Russia needs to build up a serious Middle East strategy. In the above mentioned 1956 the USSR condemned aggression against Egypt and in polite and diplomatic messages promised London, Paris and Tel-Aviv serious problems. The war ended immediately, and the USSR entrenched itself in the Middle East. 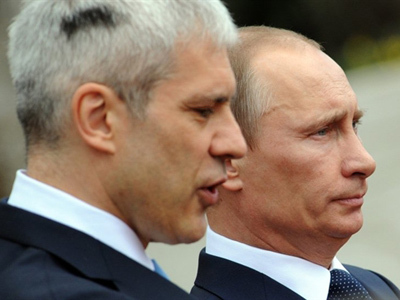 In contemporary history Russia has already tried to decide on its strategy. At the beginning of the 1990s, the USSR – Russia made a strong step in its political orientation by supporting the UN resolution against Iraq (1990) and Libya (1992). Despite certain ‘outbursts’ related first of all to Russian companies’ successful contracts in Arab countries, we did not get any definite Middle East strategy in the end. I am not talking about messiah’s tasks, like Americans set forward for themselves as ‘promoting democracy’. Russia could have been far more effectively promoting interests of Russian companies, if we speak of pragmatism. The paradox situation has been shown in the newspapers, when strong criticism of the ‘dictator regime’ in Libya is suddenly finished by words about ‘Russia’s huge losses in Libya in case of Gaddafi’s overthrow’. Even inside the tandem there are different opinions about the events in Libya. Isn’t it a sign of Russia still not having an articulate foreign policy in the Middle East?